Fig. 1. Tympanum of the east wall of the Bark Hall (Drawing F. Pawlicki, A. Golijewska). Fig. 3. 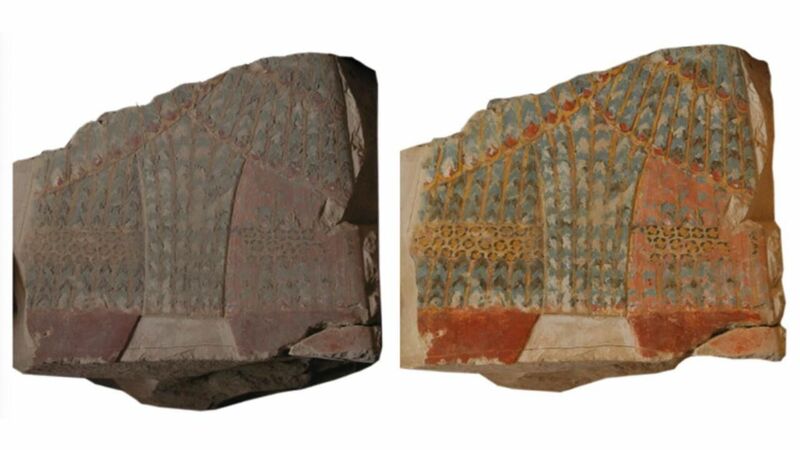 The sign kA below the skylight embrasure; the frieze of the skylight from the original phase of the decoration marked in red (Photo M. Jawornicki). Fig. 4. 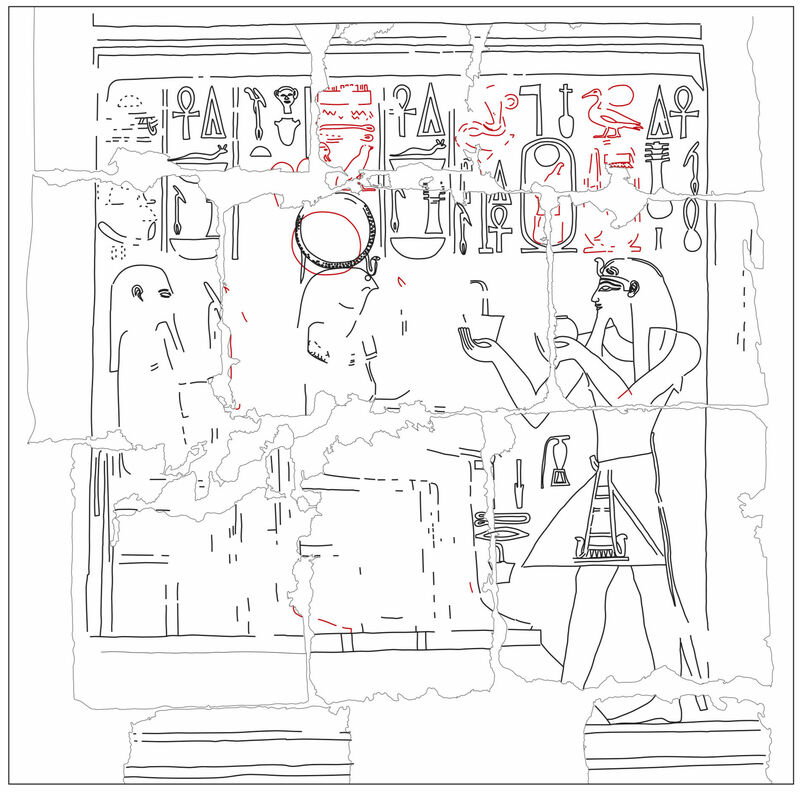 Cryptogram of the Maatkare name of Queen Hatshepsut with an inscription, east wall of the Bark Hall (Drawing F. Pawlicki, A. Golijewska). Fig. 6. High stand with traces of a dedicatory inscription on the south wall of the Bark Hall (Drawing F. Pawlicki, A. Golijewska). Fig. 7. 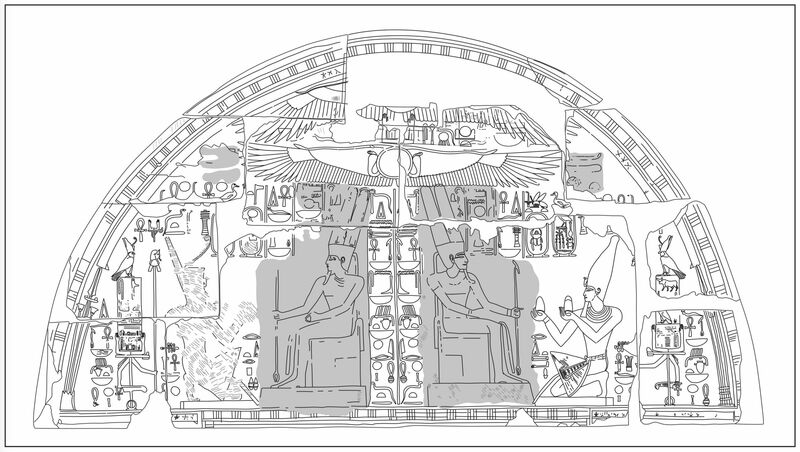 Representation of Hatshepsut changed to Tuthmosis III in the eastern niche on the north wall of the Bark Hall (Drawing A. Golijewska). Fig. 8. 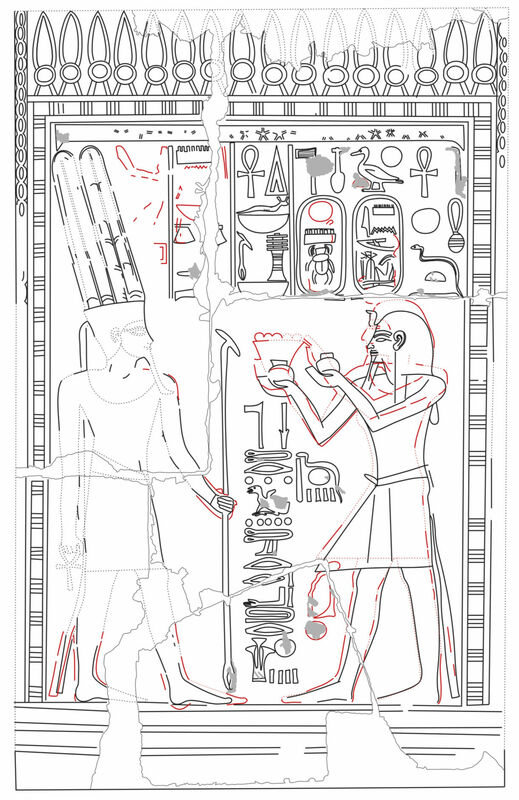 Hatshepsut censing and offering water to Montu and Atum. 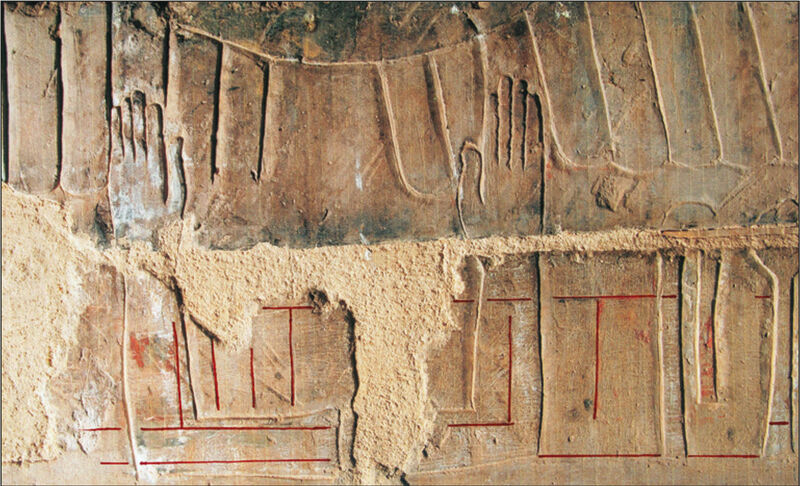 Figures of gods restored after the Amarna destruction, back wall of the Northern Side Chapel (Drawing A. Golijewska). The carved decorative surface is represented by solid, single weight lines; the consistent omission of indicating damaged areas (except for damage outlines on each blocks that are captured by thinner, light gray solid lines) add a lot of clarity to the overall presentation. Heavily modified areas appear to have a semi-transparent homogeneous gray fill, while intentional hacking is often represented by the addition of individual chisel marks to the scenes. There are multiple phases of carving captured on each drawing. Although these separate layers are not always distinguishable (see Fig. 1. ), earlier decorative phases are mostly highlighted in red that is in stark contrast with the grayscale appearance of the rest of the drawing and instantly draws our attention towards these areas. In some instances, basic reconstruction is added to specific parts of the drawings, represented by lighter gray dotted outlines, that is provided to extend and elaborate on visualizing the context of each scenes. 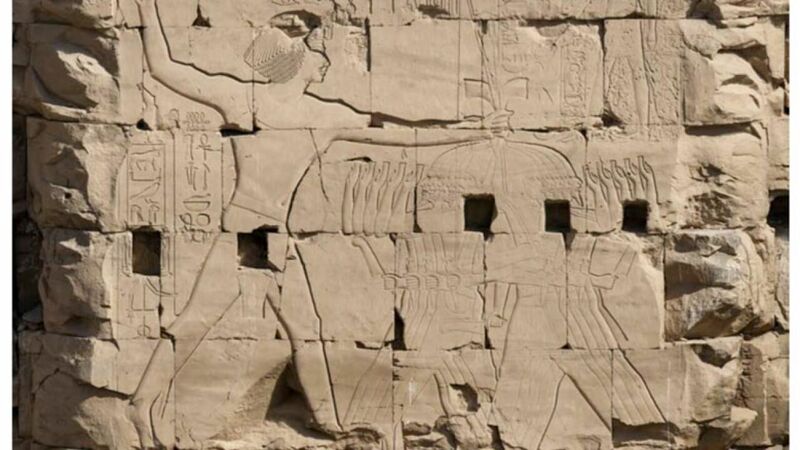 For more informationon on the main sanctuary of Amon-Re in the Deir el-Bahari temple of Hatshepsut and the work of the Polish mission, click here. The additional information about the many different projects carried out by the Polish Centre of Mediterranean Archaeology, University of Warsaw, visit their website.